The annual rate of rupture is approximately 8 per 100,000 people or about 30,000 people in the United States suffer a ruptured brain aneurysm. There is a brain aneurysm rupturing every 18 minutes. Ruptured brain aneurysms are fatal in about 40% of cases. Of those who survive, about 66% will suffer some permanent deficit. 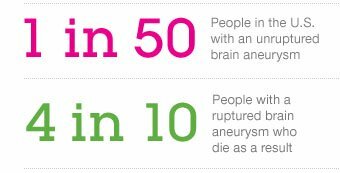 There are almost 500,000 deaths worldwide each year caused by brain aneurysms and half the victims are younger than 50. A brain aneurysm (AN-yoo-riz-um) is a bulge or ballooning in a blood vessel in the brain that can leak or rupture, causing bleeding into the brain (hemorrhagic stroke). Most often a ruptured brain aneurysm occurs in the space between the brain and the thin tissues covering the brain. This type of hemorrhagic stroke is called a subarachnoid hemorrhage. Most brain aneurysms, however, don’t rupture, create health problems or cause symptoms. Such aneurysms are often detected during tests for other conditions. Treatment for an unruptured brain aneurysm may be appropriate in some cases and may prevent a rupture in the future. What might cause a brain aneurysm? What are the symptoms of a ruptured aneurysm? A CT scan of the head is done to look for blood in the brain. If the CT scan does not show the problem, a lumbar puncture and angiogram are done. A lumbar puncture (also called a spinal tap) looks for blood in the fluid inside the spine. This fluid is called CFS, or cerebrospinal (ser-EE-bro-spi-nal) fluid. Blood in the fluid means there may be a subarachnoid hemorrhage. An angiogram is done to show the exact location of the aneurysm. A catheter (thin tube) will be placed into a blood vessel in your neck. Through this, a dye will be injected into these vessels. The dye shows up on an x-ray, and if there is any bleeding, it will appear. A person with a ruptured cerebral aneurysm needs medical attention right away. The patient may need surgery. The surgery is called a clip ligation (lie-GAY-shun). During the surgery, a metal clip is placed at the base of the aneurysm to control the bleeding and to decrease the risk of more bleeding. More bleeding can mean more brain damage. In some cases, the surgeon will suggest a procedure that blocks the blood vessel so that blood can no longer flow through it. This procedure is called an endovascular (en-doe-VASS-kue-ler) embolization (em-bo-liz-AY-shun). Metal coils are packed into the aneurysm through a catheter that is inserted into the groin. This procedure is done by a radiologist who is specially trained in this type of procedure. The procedure will be done in the radiology department.